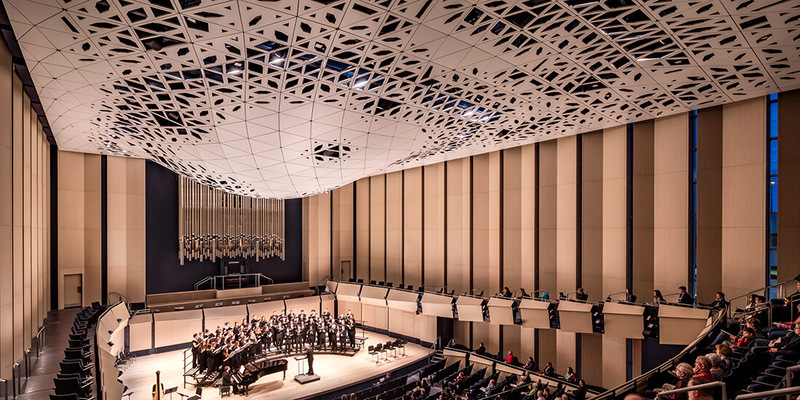 In the age of generative design, humans and computers manipulate building data to cocreate structures that could not have been conceived or built by traditional methods, such as the acoustic ceiling in the University of Iowa’s Voxman School of Music concert hall. Courtesy Tim Griffith. In the new era of generative design in architecture, engineering, and construction, designers and builders will use computers not just to describe buildings, but cocreate them. Before GPS, if you got lost while driving your car, you had to swallow your pride and stop to ask for directions. With the help of the innate intelligence of Google Maps or Waze, you can let a machine compute the best route so you can concentrate on what’s really important—driving. In the case of architects, engineers, and contractors, their computers will help navigate the design and construction process, so they can focus on making successful projects and great buildings as a result. Learn how generative design is redefining conceptualizing and building. Learn how generative design is redefining AEC processes. So what might this human-machine collaboration entail? It starts with the distinction between digital and computational. Many things are digital these days. If you flip on or off a smart light switch in your house, that’s digital. But programming that light to come on when it senses that you’re home because your phone is in the house—or turning it off when you’re thousands of miles away—that’s computational. The complex curves of Zaha Hadid Architects’ Heydar Aliyev Center were designed using early script-driven geometry engines. Courtesy Zaha Hadid Architects. The design and construction industries are now actively transforming from the digital to the computational, as “making data” (with tools like CAD or digital photos) is giving way to “using data”—using computers to generate, manipulate, and apply data to improve outcomes. People have been using digital documents for decades, from CAD drawings to spreadsheets. But when they began to apply scripts to CAD software and macros to spreadsheets, architecture, engineering, and construction (AEC) information could be accessed and manipulated—and even created—in completely new ways. That’s Allen’s computational, active process. Almost 20 years ago, architects began using a technique called scripting—a.k.a. programming—to take the geometry created by a computer and manipulate it in new ways, and a new generation of building design and construction was born. Computers overruled the tyranny of the right angle, and new shapes and curves became possible not to just draw but to build. 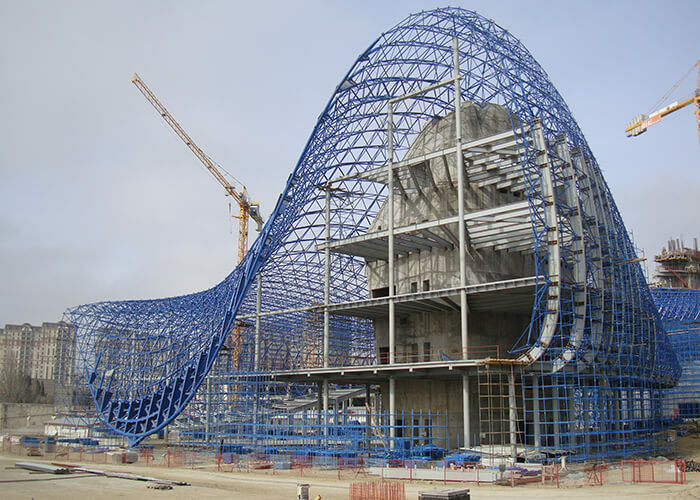 Those original scripts drove the programs available at the time, mainly geometry engines such as Autodesk AutoCAD and Rhino, and complex and ambitious designs like Zaha Hadid Architects’ Heydar Aliyev Center became possible. But today’s scripts are sophisticated algorithms that control a much wider array of the digital tools deployed for building, yielding a new strategy: generative design and construction. For the Voxman School of Music concert hall, design scripts were used to both create prototypes and describe to the builder precise panel geometry and construction sequence. Courtesy LMN Architects. But more important than the scripting technology that enhances architects and builders’ abilities to create is the critical connection between design and construction processes that generative tools make possible. For example, LMN Architects in Seattle was designing the ceiling of a new concert hall at the Voxman School of Music at the University of Iowa that needed to perform seamlessly as an acoustic reflector, a distributor of light and air, and an architectural feature. 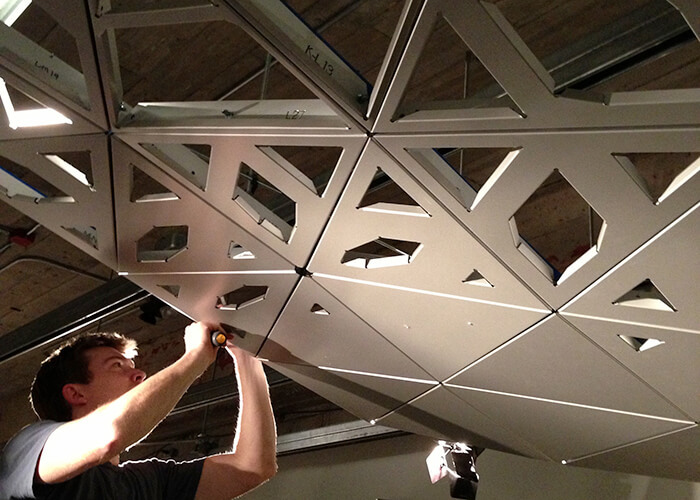 Using a series of generative-design scripts, the designers first protoyped and then created a unique architectural feature that made all that happen and used those same scripts to describe to the builder the exact geometry and construction sequence needed to fabricate and install the ceiling. The builder could then take the digital information computed by LMN’s generative algorithms directly to the fabrication floor, assuring absolute fidelity to the design the architects created, and manufacturing the system with computer-controlled accuracy. The acoustic ceiling, which could have never been conceived nor built by traditional methods, is spectacular. Here, the generative approach helped create the design and build the physical structure. At the Voxman School of Music, the generative design approach assisted in both creating the design and building the physical structure. Courtesy LMN Architects. Generative methods aren’t just useful in the design studio. 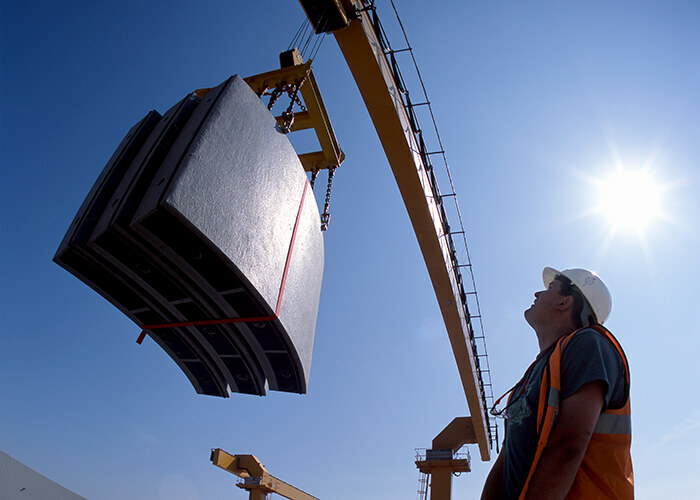 In a research project led by Dieter Vermeulen called Crane Position Optimization, using Autodesk’s Project Fractal (now called Project Refinery), the builder can choose the best modeled strategy for assembling a building from precast panels. The algorithm experiments with different positions of the truck that delivers the panels to the site and the crane that drops them into place, looking for the most efficient process given the design of the building, panel weights, equipment capacities, and locations of access points such as roads. It’s complex choreography, but the dance steps can be determined computationally long before actual construction commences. Several important things are happening here: First, a builder, by creating a generative script of the assembly process, has memorialized his or her expertise about how to best assemble a concrete building; this information is now in a reusable form, available to anyone on the project team. In the Crane Position Optimization project, an algorithm analyzes construction process variables so builders can choose the best modeled strategy for assembling a structure from precast panels. Second, rather than just relying on that expertise and judgment to make the important decisions about how to use the crane to place panels and the truck to supply them, the construction team can experiment with scenarios to optimize the construction process, and each experiment—using the digital representation of the building and the computation of generative process—is virtually cost free. This team can literally try hundreds of options to find the best approach. In fact, the generative algorithm can both “run” the simulation and measure it, and thereby “find” the best solution given parameters set by the generative script itself. 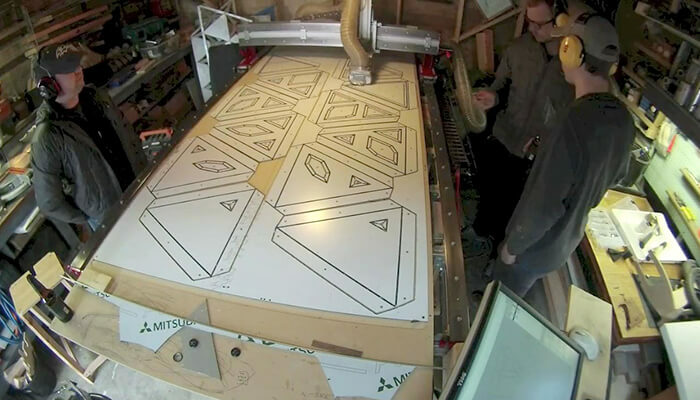 Computational simulation has left the design studio and is now in the construction trailer. Just as important, however, is that the construction knowledge built into this script might return to the design studio before the design itself is finalized, provided by the builders to the designers as they are creating the project. The choice of, in this case, precast concrete structure, has important implications for the cost, schedule, and logistics of construction of the project that might otherwise be invisible to the architects while they are conceiving the building. Imagine the efficiencies if the original design reflected not just the choice of precast, but the best way to build it? In the future, builders will give their design collaborators libraries of construction scripts, which can be applied to a series of challenging construction problems, allowing those designers to test whether something can be built while it’s still in digital form, rather than at full scale and expense on the jobsite itself. See Also: Will a Vibrant New Skyline Finally Give San Jose a Sense of Place? Digital objects (such as a precast panel) will come with computational instructions that explain not only their dimensions, weight, and connection points, but also how they interact with the installation process (with cranes, trucks, and workers) and best ways to attach, insulate, and otherwise incorporate them into the building. Construction knowledge can be created, stored, accessed, and improved over time, making the entire AEC process more fluid, integrated, and efficient. Construction has long been fraught with productivity challenges, arguments between designers and builders, and unhappy clients who file lawsuits. Generative techniques attack these problems where they live, allowing project teams to use computation to share expertise, find better answers, and improve results. Stan Allen would probably agree that while most projects today are digital, computation offers the real opportunity to build better buildings. Phil Bernstein is the Associate Dean and a Senior Lecturer at the Yale School of Architecture, and an Autodesk Fellow. His new book, Architecture – Design – Data: Practice Competency in the Era of Computation, was published by Birkhauser Architecture in October 2018.